Important: before reading this review, please read this important safety information. The Aneng AN8008 (aka Zotek ZT109) is a new model that is the same size as the AN8002, but incorporates several new features and expanded capabilities. As the AN8008 has much in common with this model, you should read the Aneng AN8002 review first of all if you haven't already. Headlines? First of all, this is a 9999-count meter. Also, it has 1µV resolution in mV mode. 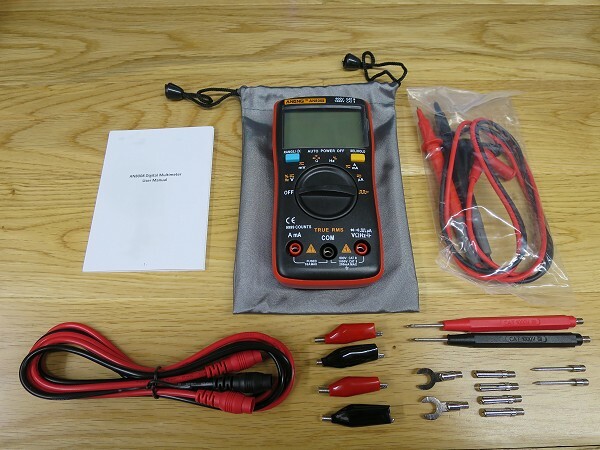 That's pretty astonishing for a hand-held multimeter - let alone one that costs just £15 delivered! Additionally, it comes with a microamp range and a manual ranging button. And it has a square wave generator - I'm really not sure how useful this is, but we'll take a proper look later. And it has a much nicer colour scheme! In short, this meter covers the omissions of the AN8002, and has some interesting additions, but as we'll see, it has a few quirks of its own. For me, it's not so much a replacement for the AN8002; rather it compliments it. 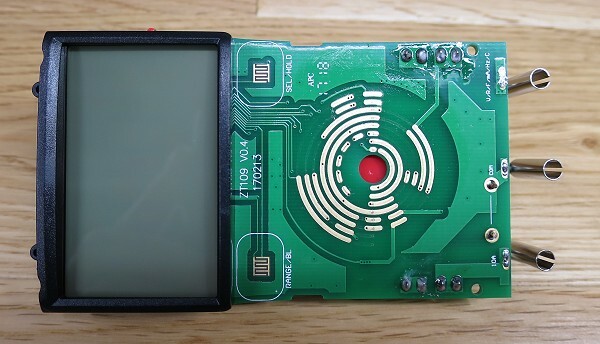 The basic DC accuracy is 0.5%, and it runs from a pair of AAA batteries (not supplied). The safety rating is 600V CAT III and 1000V CAT II, but as usual, this seems unlikely in practice, so low-energy bench use only! Inside the usual plain white box is the meter, probes, manual and the carry bag! In addition is a kit of accessories which I note is sometimes offered as an option when buying the AN8002 - though this appears to add around £2-3 to the price. When I bought the AN8008, it was only available with this kit, but perhaps soon the meter will be available without it at a lower price. The kit itself is certainly useful for low-voltage work - it's basically a pair of leads that have a socket in each end, and the various accessories screw into them. The probes are the same as the other Aneng types, and are small but the cable is flexible, and are rated at a claimed CAT II 600V, or CAT II 1000V with the additional tip covers in place. Like the AN8002, the meter feels very solid, but will slide around on a hard bench. The mode switch is good but you'll need to steady the meter with a spare finger when operating it. There are two soft-touch pushbuttons for Range/backlight and Select/Hold. This is just as nice to use as the other Aneng meters. The reassignment of the buttons definitely improves things, and relegating Hold to a secondary function (needing a long press) is no loss in my opinion - although the 2 second delay to engage hold probably makes it even less useful than it was before! The LCD is nearly as good as the AN8002 - to be honest, the slight differences I've noticed will just be sample-to-sample variations, given that they are identical parts. This one does show a hint of the unlit segments when you view it at an unrealistically low angle, but in normal use, it's great. The backlight is fine, with the usual hotspot on the right of the display where the LED is. Like all these cheap meters, it only stays on for 15 seconds. Note that this meter has corrected a small bug with the AN8002 - the labelling for the V position didn't show Hz and %, even though the select switch goes through them - here, as we can see, that's now been added to the silk-screen. Though having said that, it appears that there are examples of the AN8002/ZT102 out there that don't include Hz and duty cycle on the Volts function. Some people have been really very critical about this, but my response is simple: buy an AN8002 as well! There is no such thing as the perfect DMM, but at these prices, owning both won't break the bank. Besides, it's often necessary to measure 2 things at once, and personally the fact they are different colours helps me in those sorts of situations. As mentioned, this situation comes about as a result of using the 10A shunt for mA, and indeed, that's only possible because of the high voltage sensitivity of this version of the IC; with 0.1mA flowing through that shunt, you've only got 1µV across it. Still, at least that means you have an extremely low burden voltage - typical values for a mA shunt are 1Ω. Like the AN8002 and 860B+, in mV mode, the meter presents a very high input impedance - well into the GΩ region. There are 2 millivolt ranges - 9.999mV (1µV resolution!) and 99.99mV. There is the same intentional dead spot built in either side of 0V in the lowest millivolt range, so the meter won't show anything between below ±5µV. As with the other meters using this chipset the AC bandwidth (-3dB) is 3kHz. 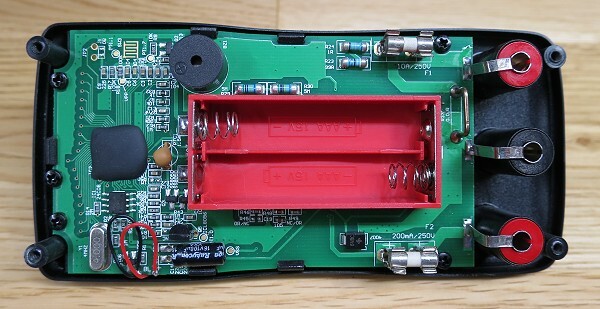 Again, the diode function gives around 3.2V open-circuit, which is independent of the battery voltage. The latched continuity mode works well, sounding at 40-50Ω. This is another meter that requires the signal to cross 0V when measuring frequency. I found that the sensitivity was rather less good than the AN8002. At low frequencies (<1MHz), it's about 600mV RMS (sine wave). At 10MHz, it's roughly 1.4V (the AN8002 was 1.2V), and the highest the +17dBm (~1.6V) from my RF generator would get me was 80MHz. There is a bug with measuring frequency on the voltage ranges. You need a minimum of ~1.7V to get a reliable reading, whereas the AN8002 works down to about 50mV, give or take, on a 1kHz sine wave. With a lower input voltage applied, if you use the yellow button to cycle back to AC, then press it again to get Hz, you get do a reading for about 3 seconds, then it changes to 0Hz. This works reliably down to about 100mV. I think what's happening here is the meter is erroneously auto-ranging higher voltage range, rendering it less sensitive. It's worth saying that the highest resistance range is 9.999MΩ. That caught me out when I was trying to measure a 10M resistor - even a cheap 2000-count meter should go to 20MΩ. The AN8002 and AN860B+ both do 60MΩ. The square wave output is a fixed amplitude of whatever the battery voltage is. It comes from a fairly high source impedance of around 2k, and it is AC coupled, so has a fair degree of "tilt" when feeding realistic loads. Going into a 'scope, it's a pretty clean square wave, free from overshoot and ringing. The rise time is about 1us. In square-wave mode, the auto power-down is disabled. Current consumption from the two AAAs varies between 1.2mA and 2mA. Shorting the probes in Ohms takes the consumption up to 2.7mA, and sounding the buzzer in continuity results in 15mA in total. The backlight takes just 5.5mA. These numbers are slightly higher than for the AN8002, but only just. The low-battery indication comes on at the same point as the AN8002, which is not surprising given that the thresholds are fixed within the IC. Good battery life is assured with these meters! Much the same as the AN8002. We have the same 10mm fuses, and minimal input protection. There's a good assortment of MELF resistors and the expected EEPROM next to the COB. 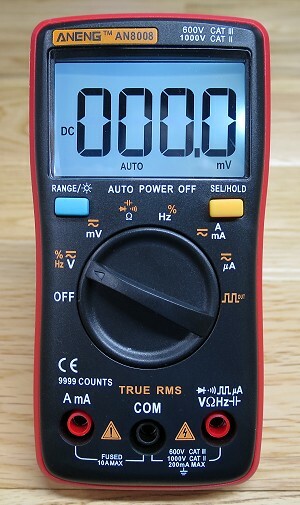 In this meter, the chip is the DM1106EN, which is an improved version of the DTM0660. Like the AN8002, there is an additional switch, still SW3, but with no other label. Pressing this does nothing ordinarily, but we determined its reason for existing previously - we need a total of 3 buttons to run through the calibration process. Again, the single electrolytic capacitor is a Rubycon YXA. Next to that is a TO92 package which is a precision 1.2V voltage reference (ICL8069 - though note the typo on the silk screen!). I wonder if this accounts for the marginally increased current consumption? In many ways this is an astonishing meter for the money. It's worth it for the micro-volt resolution alone, frankly. This - and the high-Z millivolt input impedance - is the province of high-end bench DMMs, not cheap hand-helds! The gaps in the current ranges are unfortunate, as is the 9.999MΩ resistance limit, but as I've already said, just buy an AN8002 to go with this meter! I'm really not sure why they bothered with the sqaure wave output. Personally, I feel it would have made more sense to have used the switch position to include a mA position, but I guess that was a Marketing decision. Even Dave Jones has done a review of this meter! As you'd expect, he was critical of the safety - although no mention was made of the AN8002's performance in Joe Smith's tests - but he was also impressed with the functionality and performance. I think that if he'd looked at competing multimeters at the price point - with only 2000 counts and average responding AC rectifiers - he would have been even more impressed. For low energy electronics work, it's hard to see anything else beating this meter at this price!